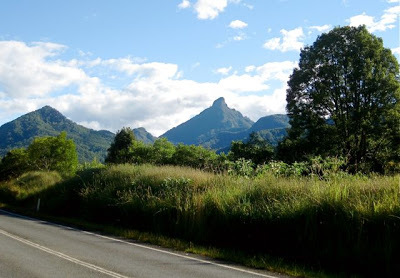 On the road to the Border Ranges with the beating heart of the Tweed Valley-Wollumbin (Mt Warning) majestically taking centre stage. Yesterday was our 41st wedding anniversary and as we were feeling as old as the hills we thought we might go for a walk in them! The last time we had been to The Pinnacle was over ten years ago and yesterday I was blown away – all over again – by this incredibly magical spot which has one of Australia’s most spectacular lookouts. Views from The Pinnacle around the edge of this ancient volcanic rim. The Pinnacle is a rock – no wider than me with my arms stretched out – that is perched on the edge of an ancient volcanic region – a caldera that is one of the largest and best examples of an erosion caldera in the world. The Pinnacle drops 1,000m from the edge of the caldera to the Tweed Valley with vast views to the Pacific Ocean and Wollumbin (Mt. Warning) – the relic core of this vast volcano looming up in the middle of this 20 million year old crater at 1,156m. This region is like being in the middle of a giant pop-up book of living treasures. Today, this area forms less than one per sent of what was the country’s largest expanse of lowland sub-tropical rainforest. Thankfully it forms part of the World Heritage Gondwana Rainforests of Australia and hopefully, what remains, will be preserved forever. 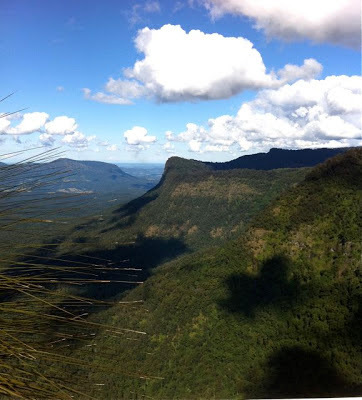 HOW TO GET HERE: The walk up to The Pinnacle is an easy 10 minute walk from the Tweed Ranges Scenic Drive on the Road between Uki and Kyogle. It took us about and hour and a half from Mullumbimby via Mt Jerusalem. A good reference source for walks in the area is Bushwalking in the Rainbow Region by Michael Smith. And, just when you thought that this might be enough for one day there are more treasures that await you just around the corner. 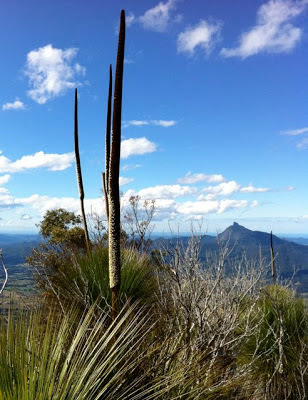 BAR MOUNTAIN: You will have passed the turning off to Bar Mountain on the way to The Pinnacle – don’t miss it. WHY? You can take a 30 minute walk into Australia’s Gondwanic past and see groves of the Antarctic Beech tree whose descendants live among us 80 million years later and are living reminders that this continent was once part of a much larger one that included most of the current southern hemisphere. 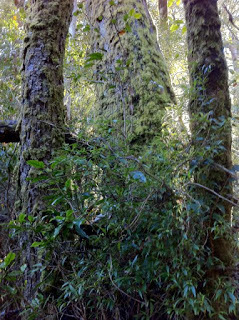 The Antarctic Beech Northofagus moorei is as old as the pyramids and live and breather before our eyes! Most rainforest trees, contrary to what you would think, are quite shallow rooted – spreading their roots into the rich mulch in the uppermost surface of the soil. 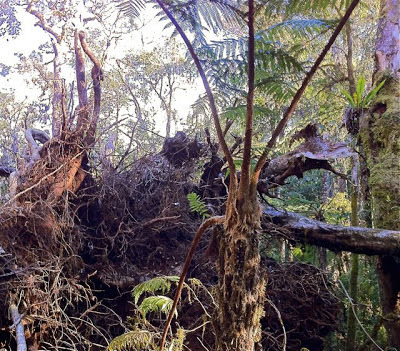 In high winds, massive trees like this just get uprooted and crash to the forest floor. NOTE: This ancient forest took a tremendous battering in the recent storms with huge trees wrenched out of the ground and tossed around like matchsticks. But, already the Northofagus, with its habit of coppicing (growing stems from the base of the parent tree) is persistently surviving with masses of seedlings growing up around these coppice circles. A coppiced circle of ancient Antarctic Beech surrounded by dozens of seedlings – the struggle for survival that is 80 million years old continues! Another reason to take this walk is that you will probably hear one of natures best mimics – the Lyrebird. You can’t miss it. As we began the Falconstrum Loop (named after the Falconstrum orchid which flowers here in early spring – something I have to go back for!) we heard the call of about ten different forest birds – one after the other, all coming from the same direction and VERY LOUD – this is Albert’s Lyrebird which can mimic just about anything – including chainsaws! Up here at The Pinnacle it is easy to feel uplifted and free from the stresses of daily life. Below you in little houses and towns people are busy living and building a future. Here as you stand on the edge of this vast view you behold the bigger picture – the life of a valley born in the remains of a volcano 20 million years ago.